I celebrate Hanukkah. Can also be spelled Chanukah or Channuka there are 16 possibilities. 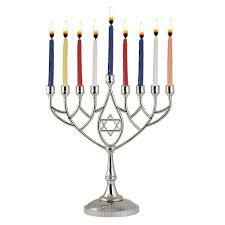 My family usually lights their own menorah. Except for my dad he’s making sure nobody catches on fire. (which personally I think is a waste of time because I’m VERY mature) For dinner we eat potato pancakes which we call latkes. I like my lakes with apple sauce because it tastes better that way. We don’t eat lakes for ALL eight days. (sadly) And it’s because of those grown ups that are like that’s not healthy and your going to get fat. Blah blah blah. After dinner we play a game called dreidel. Any way I had a great Hanukkah. I hope you did as well!